Over the years many of our guests, come to our program in search of an alternative to traditional 12 step treatment they have may have received at other programs. Ultimately they are each seeking the best alcohol rehab center they can find which will help them prepare for a new life free of substances. When we ask them what is the difference between our program and the programs they have attended in the past, the answer is always the same, "At Freedom Model I am told that it is up to me to change and that I have the power to do so, and this is incredibly life changing". If you are seeking help because of an alcohol problem and wonder what made our program so different and successful for each of our past guests continue reading to understand our life-changing methods to overcoming substance use. First and foremost we are an alternative to traditional alcohol rehabs which means that we do not teach the disease concept of addiction (which has been proven in countless studies to be patently false for more than seventy years), we do not tell our guests they should feel guilty for their problems, and most importantly we do not tell people they will be in recovery for the rest of their lives. Freedom Model Retreats was the first non-diseased based and non 12-step based program in America. We are working hard to educate individuals on the importance of knowing that addiction is and never will be a legitimate disease. You can overcome an alcohol problem, thousands of people do it every day on their own or without the endless on-going support programs and meetings that rehabs will force you into. The science of Neuroplasticity additionally proves that the brain is not a fixed organ, but it evolves and changes based on thoughts and positive motivation. Herein lies the simple truth about addiction. People do not want to deal with withdrawals symptoms, people in essence do not want to feel bad or sick. But as you begin providing negative thoughts to your brain tissue, your behaviors, and your life reflects that attitude back to you. When addiction based rehabs teach you that you are incurable, you ultimately begin losing hope and the belief that you can get better--but you're are not sick in the first place! Imagine being taught the opposite, imagine being taught that you can do things you have always dreamed of and never achieved in the past because of your fears and self limiting habits. Imagine you were given the tools, the motivation, and ultimately the freedom to live a life of happiness and success. 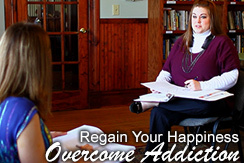 That is the difference that makes us the best alternative to alcohol rehab centers available today. We encourage you to think positive, and thus create positive behaviors and live successfully. The positive results, the positive reinforcement, and thus happiness is created within. In our program we will never tell you what to do or who to become, but instead we will give you back your freedom to be you have always wanted to be. For more information or to start your application process today call one of our friendly family consultants at 1-888-424-2626.